Twist & Loop: Purple Galore! I recently splurged on a very nice wool yarn to try my hand at felting. I was able to get TWO large bowls and one tiny bowl out of it! 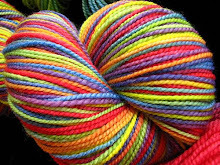 That is very exciting, makes the yarn seem more cost worthy:) This is Cascade Yarn's "Magnum" 100% wool, it is thick and beautiful and fabulous to work with. 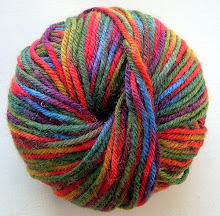 Get this, one skein cost $18.99!!! Luckily I had a 20% off coupon. Getting 3 bowls from the skein made my day! On to business. I wanted to felt something and I love felted bowls so....with a little online research I gave it my best. We have a gentle front loading washing machine so my only choice was to do this by hand as you need a lot of rough agitation for this task. In the future, I think I will find a friend with a top loading machine and give my arms a break, it was tough work! I forgot to take before pictures of all of the bowls but here is a picture of the biggest one. The other large one is a tad smaller. Notice the very obvious stitches, single crochets in a round. Felting blends these stitches together and completely changes the fabric. Very hot water, a little dish soap, and a lot of elbow grease does the job. Here is a picture of the small bowl after it has been felted! More pics tomorrow! And a close-up of this gorgeous yarn. I also made Abby a purple hooded scarf with a black edging and it is adorable. I will post a picture soon.